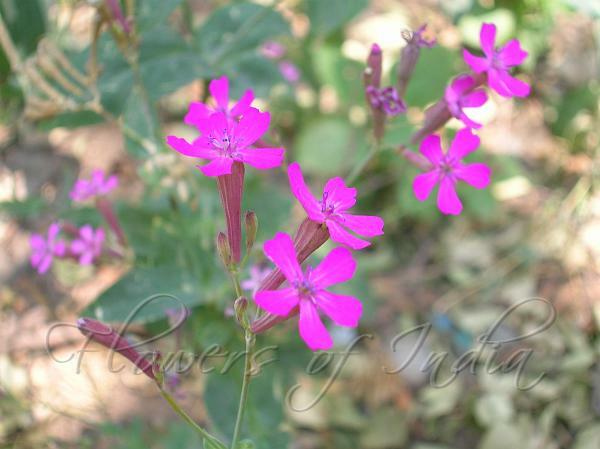 Its common name Catchfly originated because the stem exudes a sticky sap that traps small insects. Silene Armeria - a showy annual kind with leafy stems of 12 to 18 inches high, bluish-green foliage, and dense clustered heads of white, pink, or crimson flowers from July to September. When established on old walls and in rough places it will sow itself freely with fine effect, some of the prettiest wild pictures of S. Europe having arisen in this way. It is already naturalised in parts of Britain, and is just the plant for a wild garden, in light and well drained soils.